High-grade coal has been mined on the West Coast of New Zealand since the 1870s. Because of environmental impacts of the mining operation, mine operator Solid Energy is required to meet stringent requirements. 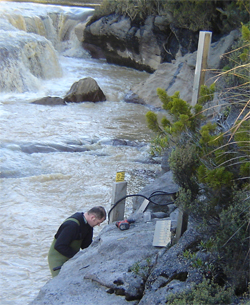 In 2007, Solid Energy undertook a project to continuously monitor water quality at 14 sites, with live data transmitted to the base office for both management and compliance purposes, and to automatically control a lime-dosing plant to raise the pH of the Mangatini stream to ecologically viable conditions. Scottech was contracted to supply and install instrumentation to achieve these objectives. A number of factors made this project difficult: annual rainfall is approximately 236 in., and the terrain is rugged, with short, steep rivers that bring massive boulders down in flood conditions, destroying anything in their path. Scottech had to find equipment fit for these conditions, with telemetry reliable enough to be used for day-to-day, critical management decisions in all weathers. CR850 dataloggers from Campbell Scientific are at the core of the measurement stations, with their display and keyboard allowing on-site calibration of the pH sensors without a laptop. This is done by entering a calibration mode, checking against standards, and adjusting calibration factors in real time. RF450 Spread-Spectrum radios were chosen for their high power output and multiple paths. They replaced older UHF radios that were unreliable and power hungry. LoggerNet software is used at the office base to retrieve data at 10-minute intervals from all sites, which is then put onto the company intranet. Sensors selected were the Campbell Scientific OBS3 (turbidity), 107 (water temperature), and CSIM11 (pH, to control lime dosing), and the OTT CBS high-accuracy bubbler (water level). All sensors were mounted in custom enclosures designed to protect the sensors from floods, but accessible for servicing. Two weather sites were also installed: one measuring general meteorological data, another measuring present weather using the OTT Parsivel sensor. These remote monitoring stations give Solid Energy continuous, up-to-date data on the critical parameters that affect the environment around their mine, and help them manage rehabilitative processes in real time. Robin McIntyre, Scott Technical Instruments Ltd.